If the weather reports are to be believed, we here in Ireland are in for one of the coldest winters we have seen in years. In these harsh weather conditions, we often have a lot of things on our mind at once: how cold it is, how wet it is, getting your jacket, remembering your gloves, and so on. With so much going on in our heads, it’s easy to overlook our feet. But winter is the perfect time to pay some extra attention to your feet, and this blog will detail just how you can do that. Since you won’t be wearing flip-flops or sandals for the next few months, now is the perfect time to take a break from pedicures. Nail polish/varnish cover your nails and make them less breathable, which can lead to bacteria getting trapped under the surface. This can lead to a number of problems such as weak nails, discolouration, and even infection, so leaving them bare for the winter will give your nails a nice extended period of recovery. On the other hand, the fact that your feet will be spending more time inside shoes and socks also means they are more susceptible to bacteria. To avoid this, you should be more strict with your rotation of shoes and socks, changing them daily, washing them frequently, and making sure that they are dry to the bone when you step out. Even slightly damp shoes can be a breeding ground for all sorts of bacteria, so putting your shoes by the radiator should be the first thing you do when you get home. When you do get home, you should switch to a comfortable ‘indoor shoe’. This will help you stick to the rotation schedule, but will also give your feet a break. Since it’s colder, it’s easy to just leave whatever you’re wearing on, even if it isn’t the warmest or most-comfortable. But spending an extra few hours in your work shoes is not advisable. Instead, you should get a pair of slippers or Ugg boots, which will keep your feet warm, while still providing them with plenty of room. You should also opt for socks that are made of wool or cotton, rather than those that are made of synthetics, as the natural materials are more absorbent and will help stop the spread of bacteria. 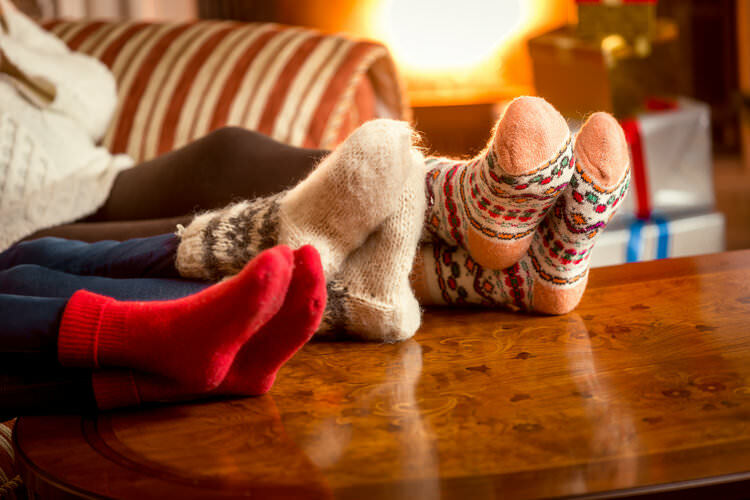 Wearing two pairs of socks can help keep your feet warm and dry. An added benefit of this is that wearing two pairs also reduces the friction experienced by your feet and makes you less likely to develop blisters, but it is important not to choose socks that are too tight. This could cut off the circulation to your feet, making them numb, cold, and less-healthy. Lastly, as your feet will be spending much more time covered up, it is important to give them a thorough wash every day. While your feet will always get cleaned in the shower, actually washing them with soap and hands is the best way to ward off any bacteria. Once a week, you should use a pumice stone followed by moisturiser, which will remove dead skin and prevent cracks from forming. Newer PostIs Podiatry Really Worth It?